John Rhys-Davies stars in "Winter Thaw"
A packed house of Heartland Film Festival moviegoers laid eyes tonight on Winter Thaw during its world premiere at AMC Castleton Square as part of the fest's opening weekend of screenings. With star John Rhys-Davies (Raiders of the Lost Ark, The Lord of the Rings films) on hand for a post-screening Q&A and after party, Winter Thaw received a warm embrace from the clearly appreciative attendees. 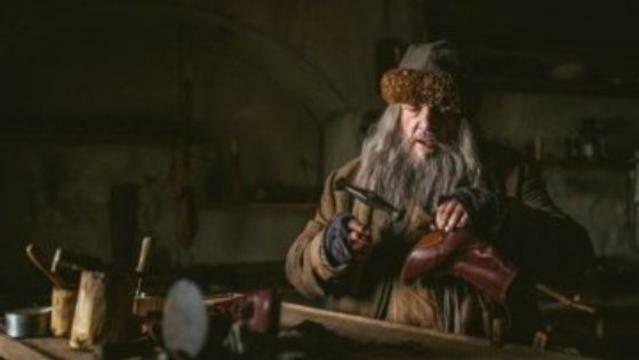 Based upon a short story by Leo Tolstoy, "Where Love is God Is Also" (also known as "Martin the Cobbler"), Winter Thaw stars the legendary Rhys-Davies as Martin, an old cobbler leading a solitary life during a frigid 1885 Russian winter. Cursed by the painful memories of a wife lost in his younger years and a growing sense of remorse over the son he banished from his life years earlier, it's only when Martin is visited by a wandering pilgrim that his once vibrant faith is rekindled. Increasingly affected by visions he experiences in the darkness of night, Martin dreams of his long lost wife and hears her warning him that "tomorrow, He will come," a warning that he interprets to mean the end of his life is near. Concerned that he has left so much of his life unresolved, Martin begins a journey of making amends to those in his life, including his estranged son, but as the day draws to a close it is one particular revelation that lights a spark of hope and a reminder of God's neverending warm embrace. Directed by Adam Thomas Anderegg, a Heartland veteran and recipient of the first ever Jimmy Stewart Crystal Heart Award back in 1997 with The Touch, Winter Thaw is a rather magnificent feature film that will have its television premiere on Thanksgiving night on BYUtv, a Brigham Young University owned broadcast network that has a tradition of producing some of the most unique and beautifully constructed holiday productions around. With nearly 250 IMDB acting credits to his name, and that doesn't even include his stage work and other non-IMDB projects, it's no longer a surprise when John Rhys-Davies turns in a masterful performance. Easily one of the most legendary character actors of this generation, Rhys-Davies embodies Martin in such a way that I found myself at various points in the 53-minute production both laughing and crying and crying again. Indeed, Winter Thaw is a film of tremendous beauty, a lovingly produced and authentically developed production shot in Lithuania that captures both the beauty and the harsh realities of life in an impoverished village. There's something rather extraordinary about watching Rhys-Davies find Martin's many nuances, refusing to reduce him to a one-note caricature and instead capturing the man's quiet desperation, transparent loneliness and aching call for a redemption he doesn't even believe is possible. Other than Rhys-Davies and Karl Johnson, as Stepanovich, Anderegg has filled the cast of Winter Thaw largely from the Lithuanian areas where the film was shot. He deserves immense credit for filling his ensemble cast incredibly well, the cast possessing a sort of earnest openness to the journey that adds immensely to the film's sense of hope and transformation. Speaking of Karl Johnson, Johnson gives a remarkably touching performance as Stepanovich, a hard working man whose memorable encounter with Martin is one of several emotionally honest and resonant scenes throughout the film. Travis Cline's lensing is refreshingly devoid of the angelic glow that so often accompanies films inspired by faith, instead realistically capturing the harsh reality of village life alongside the potentially intense conflicts that arise from living in poverty. Yet, in the end, Cline also beautifully captures the transformation that unfolds in the film, not just with Martin but in the lives of those he encounters along the way and, yes, those for whom transformation may not be an inevitability. The score from Nicholas Hooper (Harry Potter and the Order of the Phoenix and Harry Potter and the Half-Blood Prince) possesses a quiet classicism about it, not quite a traditional Russian orchestral piece yet a score that weaves itself believably into the fabric of the film's unfolding story. For information on the 2016 Heartland Film Festival, visit the festival's website. For more information on BYUtv and Winter Thaw's Thanksgiving screening, visit the BYUtv website. Richard's Note: Winter Thaw picked up the fest's prize for Best Premiere, Narrative Feature and the accompanying $5,000 prize!